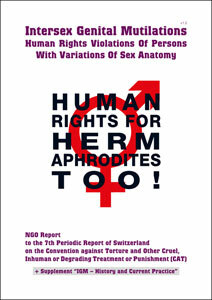 The new Thematic Intersex NGO report to the UN Committee against Torture (CAT) documents and criticises IGM Practices, proving they amount to Torture or Cruel, Inhuman, or Degrading Treatment (CIDT), and that all state parties as signatories to the Convention against Torture are under obligation to take all appropriate steps, including legislation, to prevent them (Art. 1, 2, 16 CAT), to ensure impartial investigation of all cases, as well as redress, fair and adequate compensation and rehabilitation for all victims (Art. 12, 13 and 14 CAT), and to train and inform medical staff that non-consensual unnecessary surgical and other procedures on intersex persons are a serious human rights violation (Art. 10 CAT). >>> CAT: Germany should investigate IGM Practices and compensate survivors!